My mother, Margaret Roper studied violin, piano and mandolin at the Royal College of Music and passed all three with honours. Later in her life she played in a group with her mandolin. She was also a founder member of the Basildon Choral Society. I still have their very first programme. 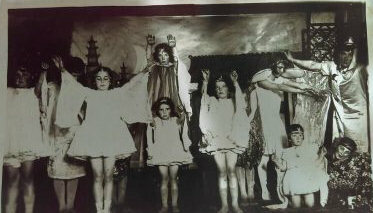 They performed in the Methodist Church in Langdon Hills around 1958/59 and I have so many old pictures. Mum played 1st violin in an orchestra with Mr Curtis as Conductor. 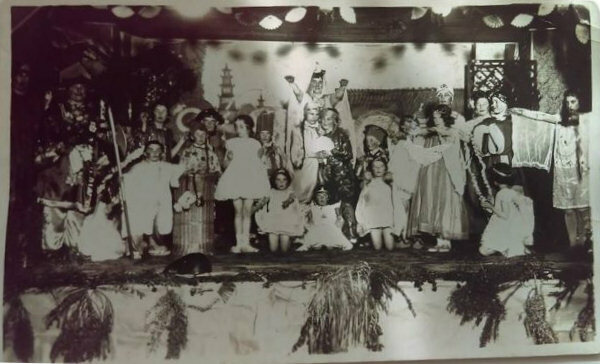 They performed many shows, including Gilbert and Sullivan operas. Very sadly she died in 1989. 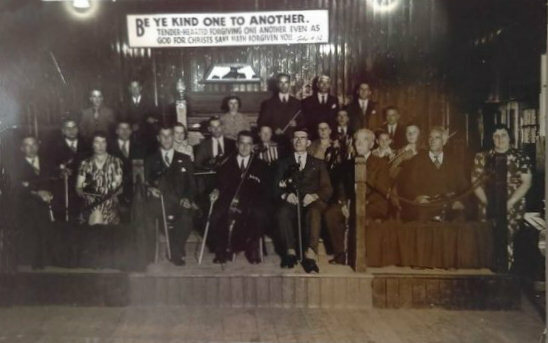 The first photo below was taken at the Memorial Hall. 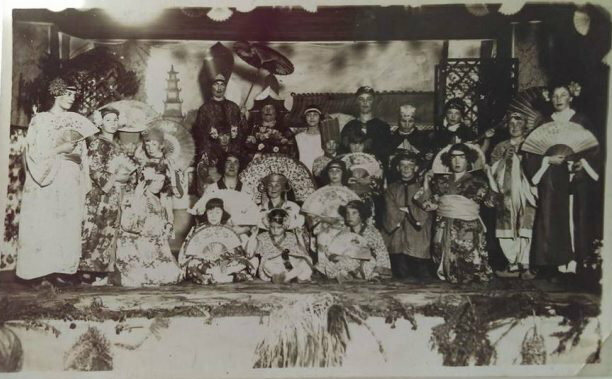 The second and third photo shows my mum a few years later in the back row with tall hat and umbrella. She had written on the back that she played the Emperor’s Adviser in the Chinese opera HOKI-POKI – HIPI HIPI TOP TOP. 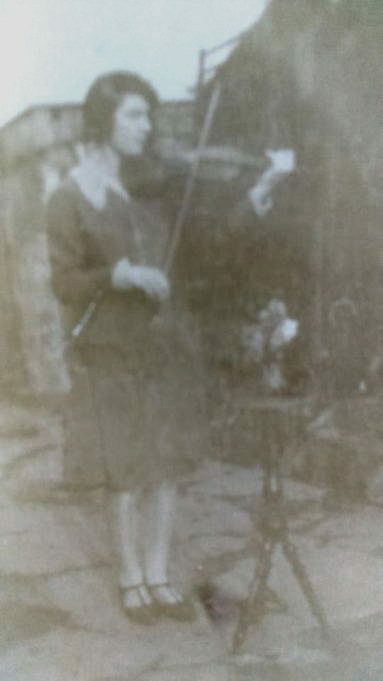 The fourth photo taken in 1922, shows mum aged just 16 playing her violin. 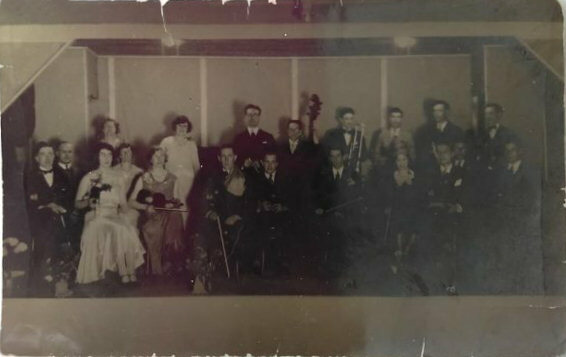 The fifth and sixth photos show mum, second in front row of the orchestra. Annual Display and Memory Day at the Manor Mission - Sat 31st March 11am-4pm. Correspondence between Andrew Greenaway and Alan Davies about Berry Lane, Prescott Avenue, Beatrice Road and Raglan Road, Langdon Hills. From Langdon Hills to Vancouver. Happy Memories at Sylvan Glen. Joseph Green, Jobbing Gardener and the tragic death of his father on Black Tuesday 18th January 1881. Keith Cullis - Shop in The Broadway, Laindon. Memories of Form 4B, 1954/55 LHR. Memory Day 25th November 2017. Memory Day 30th June 2018. Memory Days are held on the last Saturday in each month except Dec.
Peter Gibbons – ‘Birchlea’ Bridge Avenue, Langdon Hills. Remembrance Day Service at 3pm at the Laindon War Memorial Sunday 11th Nov. 2018. Road Names of Laindon 2.
Who remembers Agnes (Annie) Jones and her Mandolin?